With the spring’s warmer weather finally in sight, many GTA homeowners are looking to take advantage of this year’s “Spring Market” by selling their homes while the area’s average price is still at a record high. In a competitive real estate market like ours here in the GTA, home sellers always have lots of work to do after selecting and hiring a real estate agent – from open houses and showings, to scouring the market for the new property of their dreams. What many would-be sellers may not know, however, is that there are many ways to get the ball rolling before you actually list your property for sale, and even before choosing a realtor. Checking the lawn to make sure that it is freshly-cut, weed-free, and healthy throughout. For a professional touch, consider hiring a landscaping company and/or yard care provider — they will be able to help your front-lawn fauna shake off the wear and tear of winter, making a huge difference in the curb appeal of your home. Consider hiring a property inspection company. It is often recommended to have an inspection done on your property before you list. Pre-listing inspections for sellers are fairly common — according to the web site for the major North American inspection firm Carson Dunlop, pre-listing inspections for sellers represent about 35 per cent of the total jobs the company takes on. By identifying hidden trouble spots within your home – or, possibly, finding it to be in better condition than you thought – the report from a pre-listing inspection can help you (and your real estate sales representative) to determine a fair asking price for the property. If the report is positive, it can also be made accessible to buyers and their agents after the property is listed. Replace your analog thermostat with a newer one (e.g. Nest) that can be programmed remotely from smart devices. Think about installing low-flow showerheads – this cost-effective change has the extra benefit of lending your bathrooms a more stylish edge. If you haven’t already, consider replacing your lightbulbs with LED models, which usually offer lower energy costs and improved light quality throughout the home. Consider seeking help from a professional staging company. “Staging” refers to making your home’s interior clean, attractive, and appealing to potential buyers. When it comes to staging, getting an early start before you list is always a great idea, as it helps ensure that your home is open-house-ready as soon as it’s on the market. Professionally staged living room. Photo courtesy of 2 Sisters Homestyling. 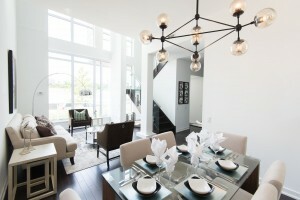 Staging, however, is a bit more difficult than simply cleaning up your house or condo. Depending on the home itself and your budget, the process can involve many steps – from removing personal effects, to renting temporary furniture and arranging it in the most eye-catching fashion. “Home staging creates a lasting first impression, and highlights the best features of the home, while minimizing any flaws,” says Kit Lee, co-founder of 2 Sisters Homestyling, a staging company based in Markham. Begin the search for a knowledgeable, licensed real estate agent. Look around at the “FOR SALE” signs in the area. After all, the best way to ensure that your sales representative really knows your neighbourhood is to select one who is already active in buying and selling there. Ask your friends and family who live nearby. Who did they work with during their last home search/sale? Were they satisfied with the quality of their agent’s service and negotiations? Trust is a big part of the relationship between agent and client, so many new buyers and sellers start with obtaining referrals and recommendations. After you have written down a couple of names, it’s time to do some homework. Based on their current listings, do they specialize in the type of home you’re looking for? You will also want to ensure that the agent’s brokerage conveys a professional image, and makes sure all of its sales representatives’ licenses are up-to-date. No matter where in the GTA you’re selling, Living Realty’s sales team is able to help answer your questions, and provide you with even more tips and information on getting started. We can even help you find your new home, too — feel free to get in touch with us today by using our quick and easy contact form.